This is the first ever guest post on my blog! Lately, some people in my close circle have been writing posts that touch me on a really deep level, and I want you to see them, too. It’s that feeling of OMG! Did this piece ever nail it on the head! It’s like a good book. You just want to tell your friends. This post is from my dear friend Marti Wolfson, MS, who has appeared on my blog several times — most recently in Foods to take when you travel (when she was starving on an airplane at 26 weeks pregnant) and last fall in Soup Session with the extraordinary Marti Wolfson, when we had SUCH a good time chopping and cooking up Spicy Thai Carrot, Corn & Tomato Bisque soup (the video is great!). A culinary nutritionist who developed the CALM™ (Culinary and Lifestyle Medicine) approach to health and healing, Marti is brilliant, graceful, and wise beyond her years. And she’s about to become a mother! (Everyone send good energy.) She calls me FGA (Fairy God Aunt). We’ve known each other for 13 years, and have cultivated a lovely relationship even though we live 3,000 miles apart. I am so grateful for Marti! Many of us are feeling the end of summer blues and shock as a new school year begins. We can choose to look at how we shift with the seasons and counter the feelings of frenzy and chaos through small, simple practices. In Chinese Medicine Fall is the season of turning in and letting go, as the life force turns back to earth. We see this organically in nature as vegetables take root, days become shorter, and the leaves fall to the ground. Fall is the perfect opportunity to ask ourselves what negative emotions, thoughts, and feelings am I still holding onto that I can let go of and die, so I may grow. There's an analogy we use in Functional Medicine that in order to keep a tree healthy and thriving, one must water the tree from the roots, rather than trying to tape the fallen leaves to the branches. One way we do this is by addressing negative emotional states as they relate to the entire person's health. When I work with clients on better eating habits, letting go of negative emotions and managing an anxious mind is often part of the conversation. In a recent dharma talk I attended, the teacher referenced the anxious mind like a drunk driver. We get so deluded by our thought patterns that we derail off center as though we are drunk. I've written about 3 ways you can practice observing the mind, watching your emotions, and taming the anxious mind. Full breathing can be one of the best ways to recenter and stay in rest and relaxation mode, the mode in which the body can best absorb, digest, and metabolize everything from thoughts to food. When we are hurried and anxious, we tend to hold our breath, physically cutting off enough oxygen to supply all of our cells. We redirect energy from the central organs to the peripheral large muscles because the nervous system senses you are about to fight a lion or tiger. Practice 4-7-8 breathing by breathing in for a count of 4, holding for 7, and exhaling slowing for 8. This will immediately reset the parasympathetic nervous system and help the mind settle. I've been practicing a version of this a lot lately as I near birth. It helps bypass my anxious thoughts. Clients will often say to me, "I can't meditate because my mind gets too distracted." That's the point and the reason meditation is so beneficial. It's not about sitting and having a perfectly clear mind where all sorts of revelations come to you. It's simply about watching the mind and coming back to the breath over and over and over again. The more we train the mind to be quiet, the more we're aware of the chatter that can cause us to become anxious and tense. Meditation teaches us to be more awake and spacious. And yes, you might even experience great revelations in meditation. If you can't sit quietly and a guided meditation is more helpful, I recommend the app Insight Timer. Nothing is more of a distraction from our feelings than our devices. As soon as we wake up we hook into the news, follow people's posts, and combat a barrage of emails. This month I'm practicing one small habit every morning. Instead of reaching for my phone in bed, I'm either getting up and sitting quietly in meditation, making a cup of green tea, or sitting with my husband as he eats breakfast. It sounds simple, but I can get addicted to my phone and forget how much better my day will be if I start it without distractions. I've even asked my family to take me off of group texts so that I'm not bombarded with messages, many of which are not personal. In an age of doing, I encourage you to practice more feeling, especially during this time of year. Embrace nature's energy to shed stuck emotions. Sitting with our emotions can be tough, but the release that comes with introspection is tremendously rewarding. Take comfort in knowing that our bodies are mirrors of nature; they will similarly shift and evolve. And if that doesn't bring you comfort, hopefully your kids being back in school will. To hear more from Marti, sign up for her newsletter list. Ginger and turmeric are two of the most powerful spices on the shelf (see Spice superstars: ginger and turmeric). Numerous recent studies conclude you’ll want to get as much of each into you as you can! 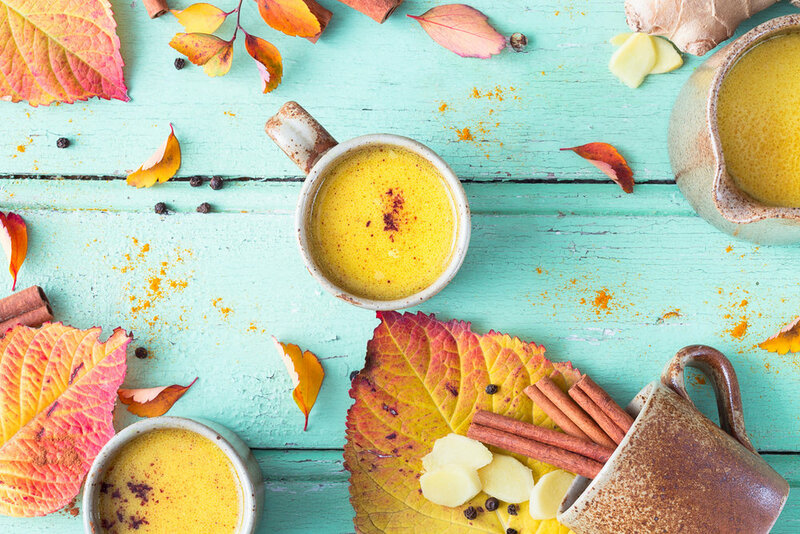 And what more pleasurable way than Marti Wolfon’s delicious Golden Milk, with turmeric, ginger, cinnamon, honey and almond milk, oh my! This is a delicious — and easy! — one to try as all the beautiful squashes begin to appear in markets. I learned (read the story in the recipe) that you don’t even have to peel delicata squash! It turns out the skin tastes fine and once it’s cooked, it isn’t tough. Who knew? In this incarnation, it also has wonderful sweetness, thanks to the roasting and the addition of orange zest and maple syrup, and that marvelous dusky intensity of thyme. A memorable combination! Newer PostObsessed with the new? Our ancestors already had the answers. Older Post In love with lentils!